Macquarie University has a proud history of leading the way on gender equity. We were the first university in Australia to offer childcare on campus and to appoint a female Vice-Chancellor. Sector data source - Universities Australia 2014 Selected Inter-institutional Gender Equity Statistics (November 2015). This is the most up to date sector data available. A further update is expected in 2018. As a university that values a diverse and inclusive environment, our commitment to gender equity remains strong. 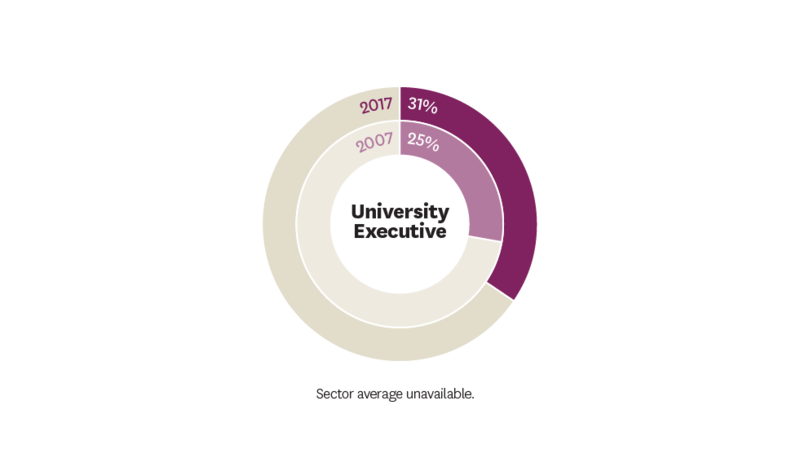 We have a bold vision to lead the way for other universities and organisations, and society more generally, to create greater equality between women and men at Macquarie. Today, many of our Macquarie women are world leaders in their field and are really making a difference and improving the lives of others. For example, they have developed a new bioinformatic tool that will aid researchers across the world in uncovering the 2949 missing proteins in the human body and released a free online behavioural oncology intervention tool that helps women decide whether breast reconstruction after a mastectomy is right for them. And they also continue to improve the hearing and emotional health of Australians. Despite the strides we have made in gender equity, we still have our challenges. 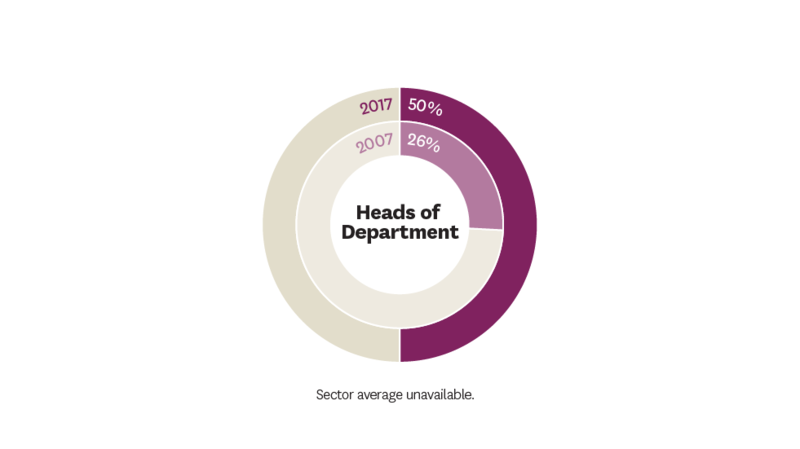 Women continue to be under-represented in senior academic positions and other leadership roles at Macquarie. While women make up 44 per cent of our academic workforce, just one third of our professors are women. The under-representation of women at Macquarie and throughout the university sector is pronounced in disciplines such as science, technology, engineering, mathematics and medicine (STEMM). Our Workplace Gender Equity Strategy sets out six key commitments: building an inclusive culture, holding leaders accountable, improving representation of women in senior academic roles and STEMM, achieving gender balance in leadership, making flexibility the norm and closing the pay gap. With this initial two-year action plan, we are making a strong statement to the University community of our commitment to create sustainable change for equality at Macquarie. Statistics show that women comprise more than half of science PhD graduates and early career researchers, but only 17 per cent of senior academics in Australian universities and research institutes are women. The loss of so many women scientists is a significant waste of expertise, talent and investment, and this impacts our nation’s scientific performance and productivity. Science in Australia Gender Equity (SAGE) is an initiative of the Australian Academy of Science in partnership with the Australian Academy of Technology and Engineering, which addresses gender equity in science, technology, engineering, mathematics and medicine disciplines. Macquarie University is proud to participate in the SAGE pilot of the Athena SWAN program in Australia. The SAGE program has been adapted from the Athena SWAN Charter, established in the United Kingdom in 2005, an accreditation and improvement program for higher education and research organisations focusing on gender and other forms of inequality. Macquarie is one of 40 institutions in Australia taking part in the SAGE pilot, which requires application for an Athena SWAN Bronze Institutional Award. In line with the Workplace Gender Equality Act 2012, Macquarie submits its public report with the Workplace Gender Equality Agency . All universities are required to submit their reports by 31 July each year. The 2017-2018 Workplace Gender Equality Agency Report is now available to view. Macquarie University employees are invited to provide comments on the report to Jo Hatton, Manager, Workplace Equity and Diversity Unit, by emailing jo.hatton@mq.edu.au. All comments are confidential. If you have any issue with the accessibility of this report, please contact Jo Hatton. The Faculty of Science and Engineering at Macquarie University celebrates its Women Making a Difference. Working in many different disciplines, women in our Faculty have wonderful opportunities to develop their careers in Science, Technology, Engineering and Mathematics (STEM) fields, and to contribute their skills and expertise to improve our world.